Jewish values are life values and the Bender Early Childhood Center is the place to raise your children rooted in your values. Our wide range of programs grow alongside your children, enriching their sense of self, enabling them to cultivate lifelong friendships, and equipping them for their unique journey in life. We support and empower families through our diverse and inclusive programming through our Parenting Center and our Grandparents Center, providing opportunities to connect and build community. Everyone is welcome. Everyone belongs. 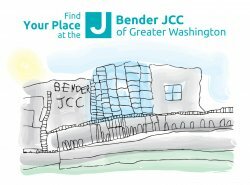 Join our Director, Ora Cohen Rosenfeld to learn more about the newly renovated Bender JCC of Greater Washington Sondra and Howard Bender Early Childhood Center. You are invited to visit the school, hear about our curriculum, tour the classrooms and the Bender JCC. Our staff makes a difference and it is our priority to employ experienced and talented staff members that meet our high standards. We provide ongoing professional development to support our staff as lifelong learners. Our talented and dedicated staff is committed to ensuring each child’s happiness, safety, and growth. If you were to peek into our classrooms, you might see children involved in a community meeting, dressing up, baking challah, immersed in constructing with LEGOs or blocks , looking at books, creating a train village, playing instruments, making signs, or drawing self-portraits. Our children are fortunate to have access to the wonderful Bender JCC facility, which includes indoor and outdoor swimming pools, a gymnasium, art and dance studios, walking paths, and the Recreation Station. With two playgrounds, a growing garden, and an abundance of grassy areas, our children benefit from experiences that enlighten and engage outside the classroom. Each day includes learning opportunities outside our four walls, so a warm pair of snow boots and raingear are a must! We are pleased to offer a program which is rich in Jewish culture, tradition, and values. At the Bender JCC Preschool we celebrate all of the Jewish holidays as well as Thanksgiving, Presidents’ Day, and Martin Luther King Day. HoliDaycare and Kid Koverage is available when the preschool is closed.